NOW WOULD BE A GREAT TIME TO DONATE. ASIDE FROM REACHING THIS GOAL, WE ALSO NEED TO INCREASE THE DONATION PARTICIPATION WHICH IS VERY IMPORTANT TO HELP WITH GRANT ELIGIBILITY. NO GIFT IS TOO SMALL OR TO LARGE. PLEASE HELP SWEET BRIAR WIN THE BEST NICKNAME CONTEST. AND VOTE ON YOUR PC, LAPTOP, SMARTPHONE FOR SWEET BRIAR. WE MUST NOT LOOSE TO THE BANANA SLUGS. The next Sweet Weeks at Sweet Briar is August 1 through 19. Sign in sheets/participation forms will be posted soon. You can also find more information on the different ways to volunteer for Sweet Briar. Sweet Briar College’s first Girls in the Liberal Arts Camp starts today! Sixty-two middle school girls were expected at check-in. They will spend the next three days exploring Sweet Briar’s academic and outdoor opportunities. Welcome to campus! Holla, holla, Class of 1967! We have until June 30 to increase participation for ALL classes… Who’s going to overcome this level of participation? http://oldweb.sbc.edu/alumdev/next-now or visitsbc.edu/gift to make a gift today. Careers now – Does your major really matter? Could a college degree in comedy be anything other than a joke? SBC Shopping Event Starts Today! 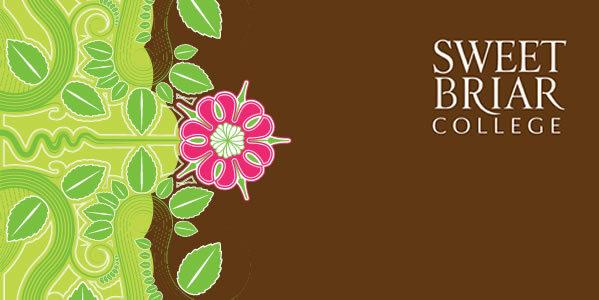 Mention “Sweet Briar” today or tomorrow and 20% of your purchase will go to SBC in time for the June 30 deadline.